Ginza was Tokyo's first Western-style shopping district and it's still where the old money shops. 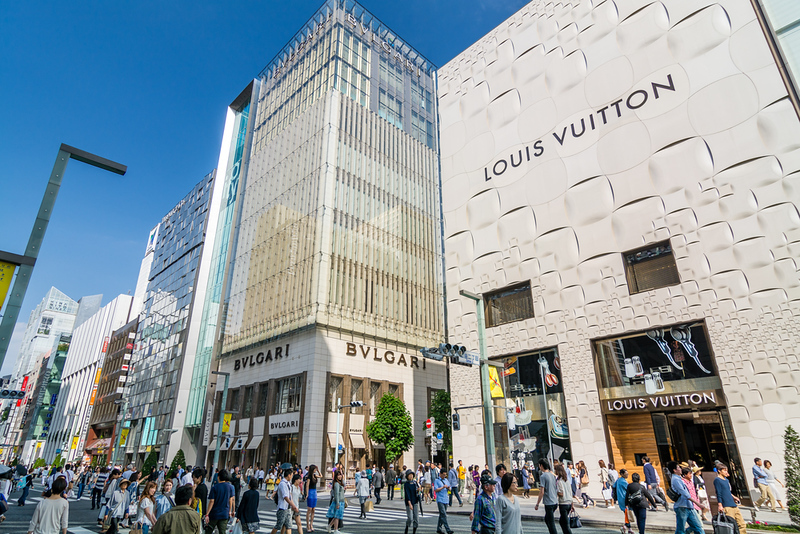 The wide boulevards and narrow lanes of Ginza are lined with high-end boutiques, department stores and exclusive restaurants. In Japan, the name Ginza is synonymous with old wealth, foreign luxury goods, powerful businessmen and well-heeled ladies who lunch. Many of the original branches of Japan's best-known and most opulent department stores are located here. Wedged between them, you'll find boutiques representing all the major Japanese and international luxury brands. And, needless to say, there are plenty of chic restaurants, cafes and bars scattered about to power the wealthy through their shopping sprees. This is an extremely pleasant area for strolling and shopping and I highly recommend a visit. Ginza is not about visiting specific tourist attractions. Rather, you should experience Ginza in its entirety. Just strolling the streets and soaking it all up is the thing to do here. And, of course, shopping is the real attraction in Ginza. So in addition to the sights listed in this section, I recommend skipping down to the Shopping section below for some ideas for places to visit. Chuo-dori, which means "Central Street," is the main shopping avenue of Ginza. It runs roughly east and west, crossing Harumi-dori at the corner where you will find Wako and Mitsukoshi department stores. Harumi-dori is the other main shopping avenue of Ginza. It runs from the famous Sukiyabashi Intersection down toward Tsukiji, crossing Chuo-dori midway. These two streets should be the first places you explore in Ginza, before branching out into the smaller lanes that are lined with boutiques and restaurants. The newly renovated Kabukiza is Tokyo's main venue for kabuki. It's worth having a look from outside and you should definitely try to take in at least one act of a show if you can (inquire with your hotel concierge or simply ask at the ticket counter here). This graphic media gallery is not a big-name attraction but it's worth stopping by when in the area to see if the current exhibit looks interesting. Ginza is filled with great restaurants. Keep in mind that Ginza is an upscale district, so prices here tend to be on the high side. Ginza is very close to the Tokyo Station and Marunouchi Area, so consider eating there if you want to save a bit of money. This approachable and excellent sushi restaurant is a great place for a delectable sushi lunch or dinner in Ginza. There's an English sign out front. I love the ramen at Ippudo and this Ginza branch is a good place to try it. The soup is thick and rich and the crispy gyoza are out of this world! This is a refined and dignified sushi restaurant on the north side of Ginza. It's not cheap but it's worth it for a memorable splurge. The sign is only in Japanese. Look for the beige bricks and the set back entrance. Café de L’Ambre in Ginza is a legendary coffeehouse that’s been in operation since 1948. Though the original owner passed away at the age of 104 in March 2018, the coffee continues to be excellent. The shoyu (soy sauce-based soup) ramen here is a tasty way to fill up for lunch or dinner while exploring Ginza. Kyubey has long been a favorite of wealthy travelers for high-end sushi in Ginza. The sushi is excellent and they are at home with foreign diners. If you love sake, don't miss the excellent sake specialist/izakaya. They've got a huge sake list and it's a good place to sample the good stuff. This casual all-around Japanese eatery is a good place for a lively dinner in Ginza. If you've got people with various tastes and preferences, this might be a good choice. I love my tonkatsu (fried pork cutlets) and when I'm in Ginza, I often eat here. It's tasty, approachable and filling. This high-end but approachable tempura restaurant is a good spot for a splurge on excellent tempura. Be warned: It's not cheap. If you need a break from Japanese food, why not try the excellent brick-oven pizza here? There are also other Italian dishes to have with it. It's casual and easy to enter. Despite being a high-end shopping area, Ginza is packed with mid-range hotels. Considering the proximity of Tokyo Station to this area, it's a good place to stay on a mid-range budget. A great value and solid business hotel near Ginza, Hibiya and Yurakucho. The rates are reasonable and there are in-room massage chairs! Recommended. Soon to be fully renovated, the Mercure Ginza is a great deal for families and has a good central Ginza location. On the west side of Ginza, close to Shimbashi, this stylish business hotel has great views and rooms that are a step up from most business hotels. It’s a nice spot. This stylish business hotel is well located in Ginza and it’s also close to Tsukiji. Rooms are a step up from your normal business hotel. Close to Ginza and Yurakucho, this standard business hotel offers competitive rates and decent rooms. On the border of Ginza and Tsukiji, this Marriott is a decent choice, especially if you want to be close to Tsukiji. With some of the cheapest rates of any hotel in Ginza and perfectly acceptable rooms, the Solaria is a good choice for those on a budget. A decent business hotel in a convenient Ginza location. The Monterey has a good location and decent rooms. The main selling point is the reasonable price. The newly refurbished Matsuya is an awesome place to shop or window shop. The food floor is one of the best in Tokyo. Highly recommended! You've probably already heard of Uniqlo. You might even have a branch in your own city. If you're looking for some inexpensive yet attractive clothing, I strongly recommend a visit to this huge branch. It's a great place to buy an item of clothing that you forgot to pack in your suitcase. This vast department store is sort of the heart of Ginza. Don't miss the food floor and the restaurant floor – plenty to choose from here! This elegant old-line department store is worth checking out, especially for the incredible window displays on street level. If you aren't familiar with the earthy "no logo" style of Muji, then check out this huge branch in the Yurakucho district, just north of Ginza. You can get some interesting and clever souvenirs here. Opened in 2017, GINZA SIX is one of the newest additions to the main shopping avenue in Ginza. Thoroughly modern and sophisticated in design and curation, it’s filled with enough shopping, food and cultural entertainment options to keep you occupied for days. This classic old Tokyo shop specializes in Japanese paper, calligraphy goods, tea ceremony items and other traditional Japanese art and craft items. It's one of my favorite shops in Tokyo for Japanese-style gifts. Highly recommended! This huge stationery store is one of my favorite places to buy pens, paper, office supplies and anything even vaguely related to those things. The Ginza branch of Japan's famous pearl specialist is a must if you're in the market for pearls. If you like Belgian beer, then you should make a beeline to this Ginza beer specialty pub. You can also get great pub grub here like mussels and fries. This basement sake specialist is a great way to work your way through the various types of Japanese sake in pleasant surroundings.